With an estimated 47% of Canadian parents reporting having a child who has been bullied, we realize the importance for children being prepared to deal with the possibility of becoming a victim of bullying at some point in their life. According to a recent study in a BC university 12% of children polled are victims of bullying once or more every week. As well, 46% of students polled have come to feel that Bullying is a "NORMAL PART OF LIFE". We do not feel that Bullying should be considered a "NORMAL PART OF LIFE". With the right skills and support, bullying can be prevented. The Standing Tall program deals with bullies on many different levels. 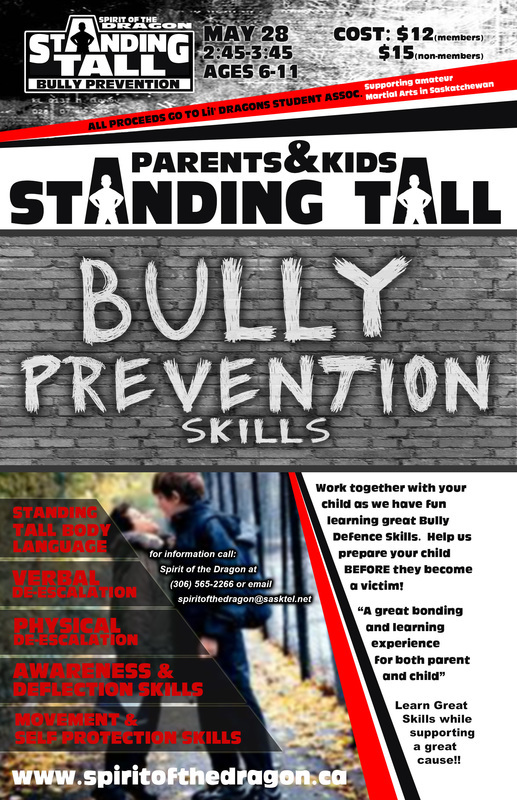 The first and foremost goal is to help children develop the ability to 'stand tall' and display the confidence necessary to deter bullies in the first place. The program then leads into both verbal and physical de-escalation skills designed to stop bullying situations before they can escalate. In the unfortunate situation where an altercation turns physical, students learn various self defense skills designed to keep themselves safe. The Standing Tall Bully Prevention program is incorporated to all of our children's programs on a regular basis. Specific Standing Tall seminars are offered at different times throughout the year. Our next seminar is a Parents 'n' Kids Bully Prevention Program. This program will not only teach children great bully defence skills, but also give parents some hands on ideas they can work on at home with their child. It is a great learning and bonding experience for both parents and children.